Takamine Hideko (1924-2010) was one of the most prolific and respected Japanese film stars of the 20th century. Starting out as a child star at the age of five, over the course of over 50 years, she starred in many notable films that spanned the war and postwar era and was the heroine of choice of prolific directors such as Naruse Mikio or Kinoshita Keisuke. During her acting career and increasingly after her retirement in 1979, Takamine also earned respect as a writer of essays, the most widely read of which were autobiographical texts that described her experiences collaborating with and at times influencing the filmmakers of her time. 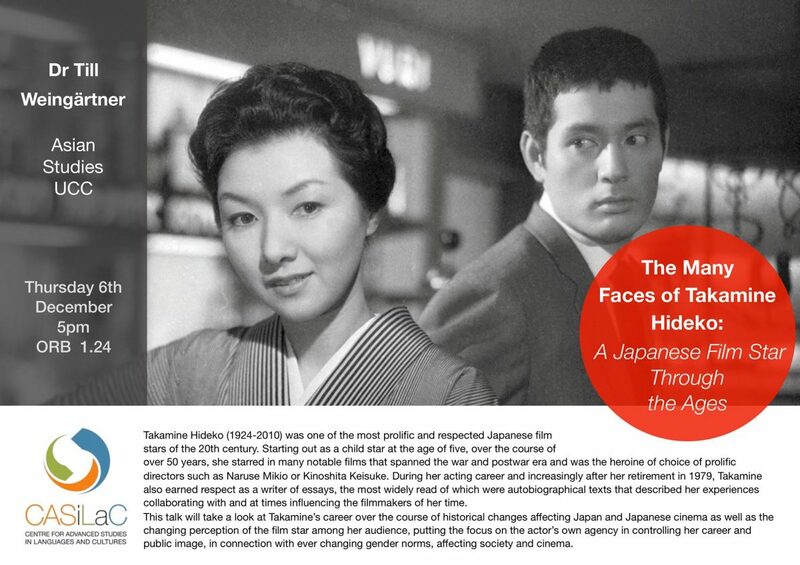 This talk will take a look at Takamine’s career over the course of historical changes affecting Japan and Japanese cinema as well as the changing perception of the film star among her audience, putting the focus on the actor’s own agency in controlling her career and public image, in connection with ever changing gender norms, affecting society and cinema.